Moore is running against appointed incumbent Sen. Luther Strange in a primary run-off for the Senate seat once occupied by now-Attorney General Jeff Sessions. So you go back to a few years ago, when Roy Moore was told to take down the Ten Commandments. Now, whether you have the Ten Commandments up or not is not the key thing. 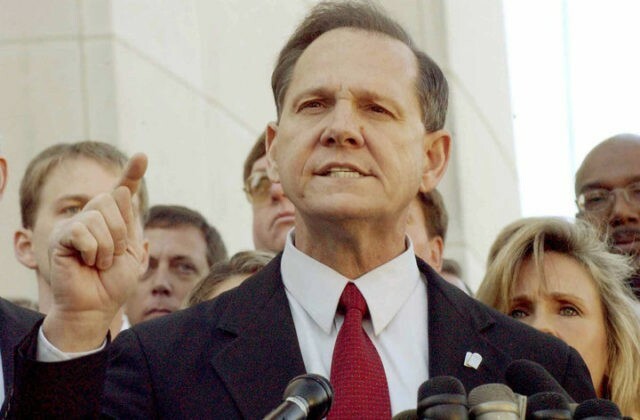 The key thing is that Roy Moore said, “No, I’m not taking this down, because I have a constitutional right here in the state of Alabama to have a Ten Commandments up on the steps of the Supreme Court here.” And he refused to take it down. FRC Action and the Family Research Council have been leaders in the fight for restoring values to our nation for years. Through their annual Value Voters Summit, countless thousands of Christians have become engaged in the political process. Together, we will work to make America good again, and great again. A strong family based on marriage between one man and one woman is and should remain our only guide and model. We must remain a moral and virtuous people, “One Nation under God.” I support freedom of worship and the recognition of that God upon Whom we have always relied in peace and war. Strange does not address pro-life issues on his campaign website. Troy Newman, the president of leading pro-life, Christian organization Operation Rescue, also endorsed Moore for the U.S. Senate. Judge Moore is a man of faith that based his decisions on the court not on his opinions, but on the law of the land, even though it has cost him personally and professionally. It’s not often we find a political candidate that will do what is right, knowing that negative consequences will come. This is the kind of man of honor and principle we need in Washington, DC. The Alabama primary runoff election is September 26. The winner of that race will face the Democratic candidate – former Clinton U.S. Attorney Doug Jones – on December 12.